"Great over spaghetti squash. This is a really great tasting dish that won't leave you craving pasta!" Heat a large skillet over medium-high heat and stir in the turkey sausage. Cook and stir until the turkey is crumbly, evenly browned, and no longer pink. Drain and discard any excess grease. Stir in the tomato-vegetable juice cocktail, diced tomatoes, onion powder, oregano, salt, and black pepper. 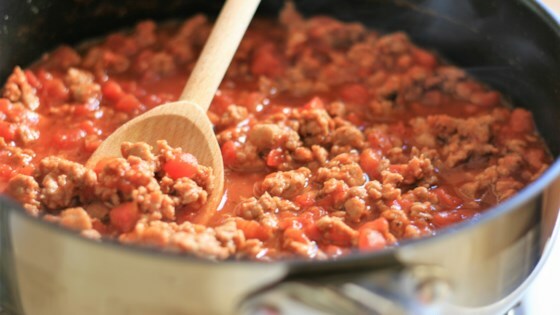 Reduce heat to medium-low, and simmer for 30 minutes. Whisk together the cornstarch and water. Slowly stir the mixture into the sauce. Simmer until the sauce thickens, about 5 minutes.